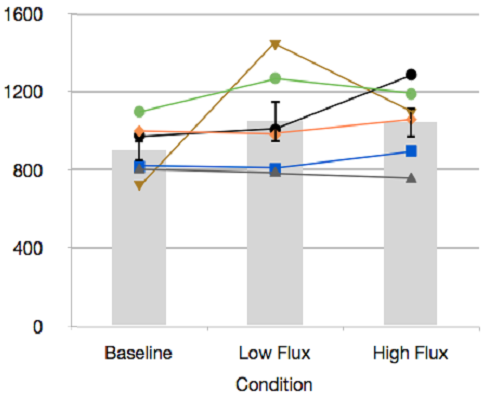 High Energy Flux, A New Determinant of Successful Weight Loss? Eat More, Train More, Lose More? Increased Resting Metabolic Rate & Satiety, Decreased Hunger While Dieting! Always hungry? Can't lose weight? "Train more and eat more" (not less!) could be the solution. 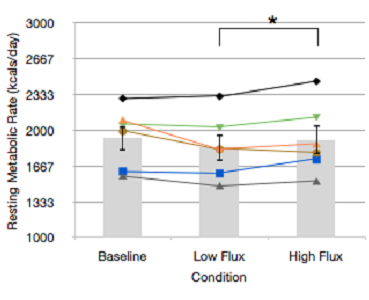 A recent thesis from Rebecca Foright, highlights that a high energy flux state characterized by high daily energy expenditure (resulting from increased physical activity) with matching high energy intake (high-calorie throughput) may attenuate the weight-loss-induced energy gap by reducing hunger and ameliorate the otherwise diet-related reduction in resting metabolic rate. Foright recruited eleven obese study participants from the Colorado State University community and surrounding areas to test her "exercise more, eat more, lose more (easily)" hypothesis. The enrollment criteria included: BMI between 30-43 kg/m², age 18-55 years, weight stable over the prior 12 months, desire to lose weight, and ability to exercise as assessed by electrocardiogram (ECG), resting blood pressure and a normal incremental exercise test to exhaustion with simultaneous ECG. Exclusionary criteria included: pregnancy or breastfeeding, smoking, use of medication known to affect appetite or metabolism (including but not limited to antidepressants and statins), or prior surgery for weight loss. In short, most of the participants were what we today call "healthy obese." "The approach used in this study was a within-subjects cross-over experimental design to test the effect of high and low flux states following weight loss on resting metabolic rate and perceptions of hunger and satiety." The study protocol was divided into four distinct phases: (1) baseline testing phase prior to weight loss; (2) weight loss phase induced by a hypocaloric diet over the course of several months; (3) weight maintenance phase in which subjects were maintained at the reduced weight for 3 weeks; and (4) experimental phase in which measures were obtained of subjects’ resting metabolic rates, fasting and post-prandial perceived hunger and satiety, fasting and post-prandial circulating glucose, insulin, and PYY concentrations, and ad libitum food intake on the 5th day following low flux and high flux phase conditions, respectively, completed in random order with a three-day washout period in between (see Figure 1). Figure 1: Experimental Timeline | #Order of Low Flux and High Flux were randomly assigned (Foright. 2014). During the low flux condition subjects remained sedentary for four consecutive days. All food was provided so that energy intakes were adjusted to maintain energy balance. During the high flux condition subjects exercised on four consecutive days (approximately 500 net exercise kcal expenditure at 60% V02 max) and were fed additional food necessary to maintain energy balance. Overall, a testing week consisted of two baseline days and 5 high/low energy flux days. In that, three identical experimental days were used to examine possible differences in perceptions of hunger and satiety, blood glucose, insulin, and PYY in response to breakfast preload, and ad libitum intake from a meal buffet. Note: The caloric deficit that was designed to produce a 7% weight loss over the course of the 12-16 week long weight loss phase was identical in the undulating high and low energy flux phases of the study. The results are thus not a consequence of the increase in energy intake during the high flux phase (in fact the opposite was the case in some subjects, anyway). The extra calories were after all burned again during the four exercise days. "Now what is particularly interesting about the study is that the researchers did not content themselves with measuring the acute effects of high vs. low energy fluxes. They also investigated what happened after the 12-16 week weight loss phase. To minimize the acute effects attributable to the dynamic phase of weight loss on metabolic rate and on hunger and circulating appetitive hormone concentrations, subjects were maintained at the seven percent lower body weight for a three-week period prior to the start of the low and high flux conditions. During these three weeks subjects reported to the KANC every three days to monitor weight and minimize weight fluctuations. Subjects were instructed to consume a slightly increased kcalorie intake compared to the weight loss phase to maintain weight" (Foright. 2014). 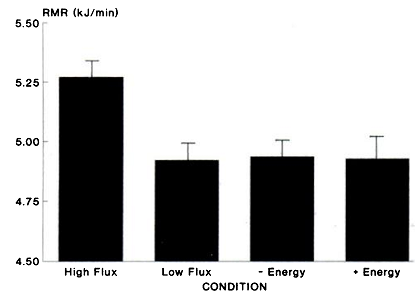 Put simply, the scientists wanted to know, whether the effects of high vs. low energy flux dieting would influence a dieters ability to lose weight and maintain the newly achieved weight. [...a]s designed, the energy intake for high flux (x±SD: 3,191±587 kcal/d) was significantly greater (p < 0.001) than for low flux (x±SD: 2,449±406 kcal/d) (Figure 2, right). In accord with the study design, there was no difference in macronutrient composition between the two conditions (data not shown)" (Foright. 2014). Now all that would be pointless if both groups lost weight similarly effortlessly. In reality, though, On the subjects were significantly more hungry and felt less satiated at the end of each of the days during low flux. the subject who saw the greatest benefit (Foright. 2014). On the other hand, they were significantly more full at the end of each of the days during high flux (p=0.015). There was a strong trend for the subjects to exhibit greater hunger throughout the day during low compared to high flux (p=0.09). No, this is not an outlier study: In 1995 Bullough et al. were already able to show that the resting metabolic rate on diet + exercise regimen that established an identical energy balance was greater in trained than in untrained subjects only when trained subjects were in HF. As Bullough et al. point out "[t]hese data indicate that RMR is influenced by exercise, energy intake, and their interaction and suggest that higher RMR in trained vs untrained individuals results from acute effects of HF rather than from a chronic adaptation to exercise training." (Bullough. 1995) Bell et al. on the other hand found that "[m]aintenance of high energy flux via regular exercise may be an effective strategy for maintaining energy expenditure and preventing age-associated obesity" (Bell. 2013). And Goran et al. (1994) found that "RMR can be elevated during a state of energy balance when energy flux is increased," and that the "magnitude of adaptive change in RMR is similar in response to increased EI [energy intake] and/or PA [physical activity]." Interestingly, the subject who saw the largest benefit (see Figure 3) was also the guy or gal who consumed the most energy in the low flux condition (orange line in Figure 4). So what about the health markers? The fasting insulin decreased following weight loss and was significantly lower on the LF (8.3±1.1 µU/ml) and HF (6.4±0.8 µU/ml) experimental days compared to the pre-weight loss baseline (11.8±0.6 µU/ml). In other words, while both groups saw significant increases in insulin sensitivity due to dieting, the effects were (unsurprisingly) significantly more pronounced during the high energy flux (=exercise phase). In contrast to what the significant differences in hunger ratings would suggest, there were no general differences in fasting PYY (the satiety hormone) concentrations among pre-weight loss, low and high flux conditions respectively. 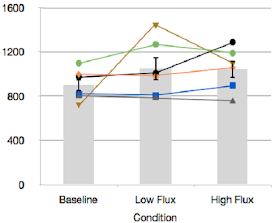 Figure 5: Insulin and PYY levels of the subjects in the high and low flux phases over the course of the day (2014). If you look at the data in Figure 5, it's obvious that the PYY levels were, in fact, lower in the high flux condition - from 180-360 minutes in the high flux condition compared to the baseline (pre-weight loss) and low flux, to be precise. So what? Beneficial, not beneficial, or not sure? In spite of the absence of significant differences in PYY ("hunger hormone"), the subjects' post-diet response clearly indicates that the energy deficit was easier to tolerate in the high flux phases. The slightly, but significantly higher resting metabolic rate during the high flux phases further underlines that there is a benefit of eating more and training more. The fact that this didn't show in the hormonal markers the scientists analyzed may simply be a consequence of choosing the wrong markers. Acetylated ghrelin, for example, would be such an alternative marker... and seeing the cortisol and testosterone would also have been interesting. The way it is, we still have the decreased subjective hunger, increased subjective satiety, and increased RMR which speak in favor of the high flux state dieting. What we do not know, though, is whether the effects will be the same in athletic (vs. sedentary) subjects [based on my personal experience we will!] and whether they can be maintained for say 4 weeks instead of four days | Comment on Facebook! Bell, Christopher, et al. "High energy flux mediates the tonically augmented β-adrenergic support of resting metabolic rate in habitually exercising older adults." The Journal of Clinical Endocrinology & Metabolism 89.7 (2004): 3573-3578. Bullough, Richard C., et al. "Interaction of acute changes in exercise energy expenditure and energy intake on resting metabolic rate." The American journal of clinical nutrition 61.3 (1995): 473-481. Goran, Miachel I., et al. "Effects of increased energy intake and/or physical activity on energy expenditure in young healthy men." Journal of Applied Physiology 77.1 (1994): 366-372. Rarick, Kevin R., et al. "Energy flux, more so than energy balance, protein intake, or fitness level, influences insulin-like growth factor-I system responses during 7 days of increased physical activity." Journal of Applied Physiology 103.5 (2007): 1613-1621.